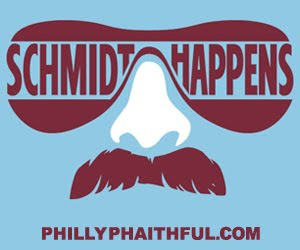 I'm Just Saying, Philly: Oh, What a Game! 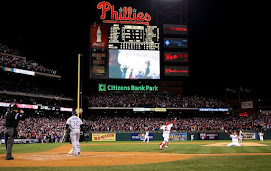 Last night the Phillies overwhelmed the Dodgers from start to finish, tallying an 11-0 win in Game 3 of the NLCS. Cliff Lee continued his brilliant post season pitching, thoroughly dominating the Dodgers with his best outing, yet. And, Phillies hitters wasted no time in supporting him, putting 4 runs on the board in the 1st inning and 2 more in the 2nd, seemingly knocking the life out of the Dodgers. After great efforts in his first two playoff games, somehow Lee improved on those efforts by completely shutting down the Dodgers. He limited them to 3 base runners all evening, punching out 10 hitters. The Dodgers could manage only 3 harmless singles over 8 innings and never advanced a runner past second base. On a crisp October evening, Lee demonstrated the determined, laser-like focus that has become his signature, aggressively pounding the strike zone with an ever changing array of pitches. Meanwhile, the Phillies were scoring runs early and often. Ryan Howard continued to show his growing maturity, transitioning from slugger to big game, clutch hitter. Once again he was in the center of the action, ripping a 2-run, 1st inning triple down the right field line to begin the scoring parade. He even added a subtle, yet important contribution when he made a terrific scoop of a Chase Utley throw that quieted any potential further scrutiny of Utley's defensive struggles. The guy behind him, Jayson Werth, continues to mature in his own right and followed Howard by launching a rocket deep over the center field wall into the ivy covered brick wall. His growing reputation as a right handed power presence behind Howard has surely played a role in Howard's second half tear as it deters pitchers from pitching around him and provides separation from the next looming left-handed slugger, Raul Ibanez. After posting 4 runs in the first, the Phillies did not let up on starter Hiroki Kuroda in the second frame. Doubles by Carlos Ruiz and Jimmy Rollins sent him to the showers after 1 1/3 innings, and helped the Phils increase the lead to 6-0. The Dodgers appeared to deflate, seemingly becoming resigned to the notion that coming back on this cold night was unlikely. While Lee was pounding the zone with unhittable pitches, Phillies hitters were pounding Dodgers pitchers. On a night that the team in blue was having trouble simply laying wood on Lee's offerings, the prospect of reversing a 6-0 deficit was becoming increasingly daunting. Chad Billingsley restored order for a couple innings before the Phillies struck again with two outs in the fifth. Ibanez walked and Pedro Feliz then tripled high off the wall in right-center. Ruiz continued to build his reputation as post season hitter, quickly driving home Feliz with his second hit of the game. With the crowd still roaring, enjoying the events of the night and cherishing the tremendous capabilities of their beloved team, Shane Victorino punctuated everything with an exclamation point by jacking a 3-run homer into the second deck in right to extend the lead to 11-0. At this point, Manuel thought better of sending his ace back out, and instead called upon Chad Durbin to finish things off. Durbin preserved the shut out by setting the demoralized Dodgers down in order and sent the fans to the exits still buzzing from an electrifying performance. The Phillies appeared to make a resounding statement that they were not about to let their disappointing Game 2 loss have any lingering effect or derail their mission to repeat as World Series Champions. This is about what you would expect from a team that continues to only get better, secure in knowing they have a truly special team on a mission. The two teams go back at it tonight, with Joe Blanton facing off against former Phils hurler Randy Wolf. The Phillies hope to pick up where the left off last night.